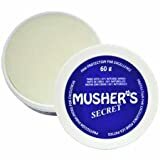 If you own a dog, then you most likely know what a dog paw balm is and what’s it for. If you want your dog to be healthy and protected against irritants, then you have to make sure to put some paw wax on his furry little paws. 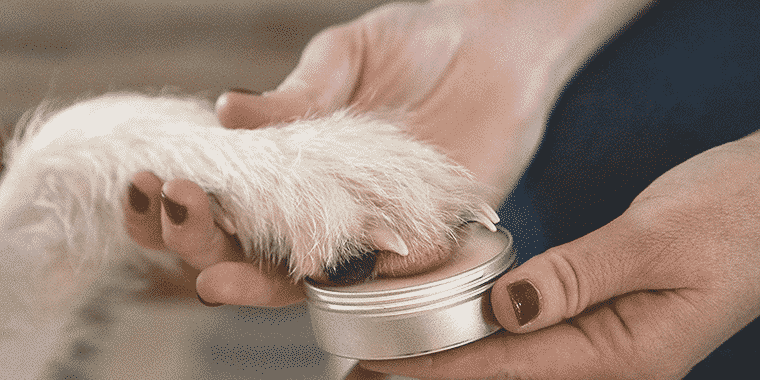 If you’re having a hard time choosing which one to buy because of all the brands on the market, then this guide should help you find the best dog paw balm. We’ve got a list of the best products you can buy. Before we get to the list, it’s really important that you understand what dog paw wax is and how it works so that you know how to choose the best one. First of all, a dog pad cream is a type of substance used to protect your dog’s paws and keep them hydrated. When a dog’s paw is dry, it might bleed or even crack, especially during the cold weather. The wax moisturizes the paws so that the bleeding can be prevented. It also protects the paws from toxic substances that your dog may step on while walking on the roads. The problem is that dogs sometimes love to lick their paws when they get home. If they do this, they might eat some of these chemicals. By using paw balms, they won’t be infected. It’s like letting your dog wear dog boots but without the actual boots. Now that you know more about what dog paws are, let’s talk about what to look for when buying a dog paw balm. There are many types of moisturizers that you can use on your dog’s paws. Generally, there are several types that you can buy. While all of them pretty much have the same effect, it’s really their texture and the preference of your dog that makes the difference. They are available in 5 different types: paw butter, soothers, lotions, waxes, and balms. The next thing that you have to take note of are the ingredients used. The more natural the ingredients are, the better for your dog. You have to choose the brand without any harmful ingredients in them. Some of the ingredients that you may want to avoid are mineral oils and petroleum. You may also want to avoid zinc oxide, lidocaine, diclofenac, hydrocortisone, and calcipotriene. Though they may be safe for humans, they’re extremely toxic to dogs. Some of the ingredients that are safe for dogs include shea butter, vitamin E, beeswax, coconut oil, rosemary extract, and lavender oil. 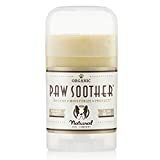 It’s better to buy a natural dog paw balm rather than one with chemicals. The last thing to look out for is the price and brand of the moisturizer you want to buy. Since you’re applying the product on your dog’s paws, you want to make sure that you buy the best one there is. In order to buy the best dog paw moisturizer, you have to choose the right brand. The most ideal way is to look at reviews of the product you’re eyeing on. The 12 brands that we’ve listed below are some of the best that you can find in the market. This is one of the best paw wax products you can find in the market. 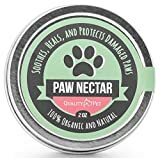 It’s made of 100% organic paw butter which is very safe for both dogs and humans. It also has a 100% money back guarantee in the event that you’re not satisfied with your purchase. The best thing about this wax is that it contains a generous amount of vitamin E. As it’s really easy to apply, you won’t have any trouble putting it on your dog’s paws. It can protect him from hot roadsides, melting ice, melting salt, and even hot sand. Basically, it’s an ideal product for hunting, mushing, or walking activities. This product is very well-known among dog owners as their dogs actually like the balm. Most dogs don’t like balms because of their odor and taste. However, Pawstruck’s balm is both tasteless and odorless which keeps your dog happy and healthy. 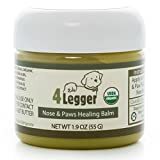 This healing balm is special as it’s made of hemp oil to offer a healing effect on your dog’s paws. It also has a pretty pleasant smell just in case your dog smells or licks it. With this product, you can protect, nourish, moisturize, and even heal your dog’s damaged paws. This is a serum type balm that isn’t as slippery and moist as most balms. This is why it’s one of the best products to apply to dogs who like to walk around outside. It is easily absorbed by the paws which means it also dries easy but still keeps your dog’s paws properly moisturized. Burt’s Bees is a brand that’s been known ever since 1984 for their lotions which are healthy for both cats and dogs. Some of the main ingredients of this product, in particular, are rosemary which is used for moisturizing and olive oil which is used for a smoothening effect. 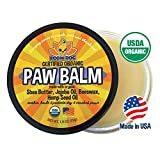 This natural soothing balm is great for healing rough and dry paws. Aside from that, it also specializes in healing a sickness known as hyperkeratosis or hairy paw. It heals and also hydrates paws so that wounds can be avoided easily. 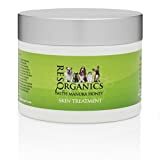 As it is made of a combination of manuka honey, aloe vera, olive oil, hemp oil, and more, this skin treatment formula features an antibacterial and antiviral effect. It also has an anti-inflammatory effect which makes it perfect for healing and keeping your dog’s paws healthy. The Max and Neo paw and nose balm is made of calendula which comes from Marigold plants. As it is made from a very powerful flower, it has antibacterial and anti-inflammatory properties. It is for this reason why it’s great for healing wounds and cuts. Moreover, the manufacturer has decided to help rescue one dog at a time for every purchase made. 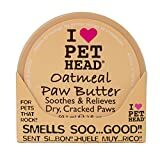 This oatmeal-based paw butter has a soothing and moisturizing effect that works on both winter and summer time. As it has a smooth consistency, it’s easy to apply on paws and even noses. It’s also free of any harmful ingredients like DEA or petroleum. 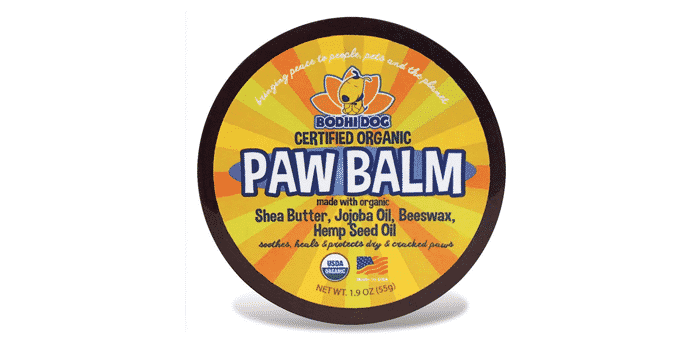 The Bodhi Dog paw balm is a specially-made for your dog’s paws which is certified organic. It’s made of a combination of jojoba oil, shea butter, hemp seed oil, beeswax, and calendula extract. As it’s a natural, non-toxic, and hypoallergenic, you don’t have to worry about your dog being exposed to chemicals. 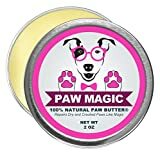 This organic dog paw butter from Paw Magic is of top quality as it is made of enriched organic coconut oil which has a great moisturizing effect that can help cure hyperkeratosis and wounds. If your dog is suffering from dry and cracked paws, applying this butter will help alleviate the pain almost immediately. Q: What causes dry paws? A: There are several reasons why a dog’s paws may dry up. One of the most common reasons is the weather. During winter or summer, paws tend to dry out. In the summer, the paws may even get burned or scorched due to hot roads. Other reasons are chemicals and allergic reactions to these chemicals. For instance, when your dog steps on melting ice in the winter, he will be exposed to chemicals. Also, when your dog walks all over your lawn during the summer, his paws might get an allergic reaction to fertilizer. Q: Can you ignore dry paw pads? A: While dry paws don’t really sound that serious, it’s quite a serious problem for dogs. A dog’s paws are really smooth and soft. Therefore, if your dog’s paws are dry or cracked, then it could be a problem. Your dog could have a hard time walking on the ground, especially on rough surfaces such as pavements and sidewalks. Some cases of cracking or dryness may even lead to paw bleeding which could ultimately lead to infections. This is why it’s very important to buy a good brand of dog paw lotion or dog paw wax to prevent dryness. You especially need dog paw balm for winter and for summer when dogs are very vulnerable to cracked paws. Q: Can I make paw balm at home? A: Yes, it is possible to make a paw balm at home. Typical paw balms are made of olive oil, coconut oil, beeswax, and shea butter. With the appropriate amount of these ingredients, it’s possible to make a homemade dog paw balm or wax. With homemade ingredients, you can at least be assured of your dog’s safety. However, these are just the most basic ingredients that you can give your dog. The balms and waxes found on our list above are made of more beneficial ingredients that even contain vitamins for your dog’s paws. As dog owners, it’s our responsibility to make sure that their health is in good condition. This means that we have to help them prevent having any sort of paw conditions or infections. In fact, I would say that a dog paw wax is as important as a dog shampoo or even dog nail clippers for that matter. It’s totally essential to the needs of your dog. You’ll need them if you want to ensure your dog’s paw health.